First, I want to thank everyone for their very kind comments on my post yesterday. I didn't intend for it to be a bid for sympathy, but I won't deny that the outpouring of concern and compassion made me feel really warm and fuzzy. The Blogosphere can be a truly wonderful place. That said, I'm done wallowing. I need some happy. 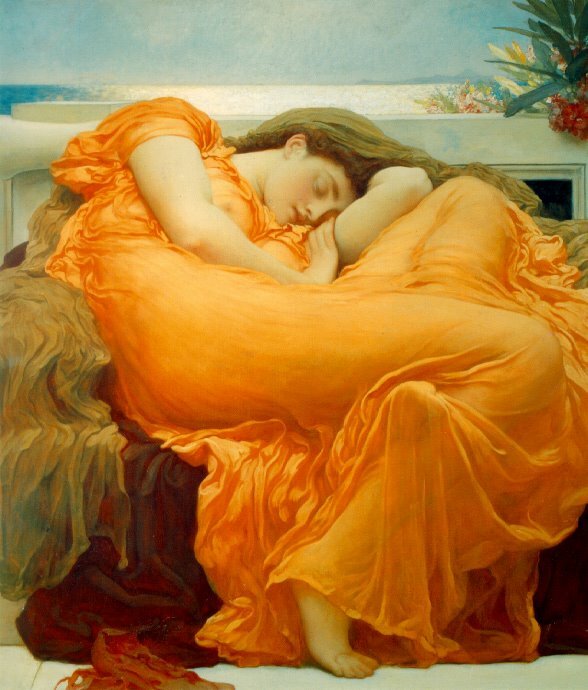 And what makes me happy is Flaming June. One day, I am going to hang her picture in a room painted the same color as her gown. It will be a sunny room with lots of windows, and lots of warmth. Maybe a fireplace for chilly fall and winter evenings. Lots of bookshelves and a big, comfy chair. So who is Flaming June? I wrote about her a while back. And, as a present to myself, I'm going to repost what I wrote. This painting is called "Flaming June" and even the name makes me feel light-hearted. June...I feel like she could be my friend. I think we would talk about books and babies, life and lovers, poetry and politics. The color of her gown is vibrant and liquid; juicky like overripe Mediterranean fruit. I can feel the gossamer folds running like water between her thighs; cool and silky on her fevered skin. The ocean breeze caresses her, whispering through her hair and coaxing from it, the aroma of jonquils and baking bread. It carries the faint, delicious promise of summer rain. I wonder if it is the sun that has warmed her, or a lovers touch. I wonder if its the exhaustion of ardor that tranquilizes her or just the limpid peace of a perfect day. I love Flaming June. I love the happy color of her dress and I love that she looks like she occassionally enjoys a cheeseburger and milkshake. My kind of gal. Man. I wish I could sleep like that. Wearing the gown wouldn't be half bad either. Wow, your description is as beautiful as the picture! I just knew what I was going to see before I got to the picture. Lovely description. I completely agree. Flaming June is one of my favorites! That's what I think of when I need a little happy, too. She is just so peaceful and beautiful. Would you believe we looked at house for sale a few months ago and the living room was painted a slightly lighter orange than her gown, and she was the main artwork, right over the couch. Shoot. That was enough to make me want to buy the house right there. And your post about her is beautiful.